New home track in North Texas under construction. Just finished connecting everything today and I am ready to do some testing before detailing. Posting some pics of my progress so far. 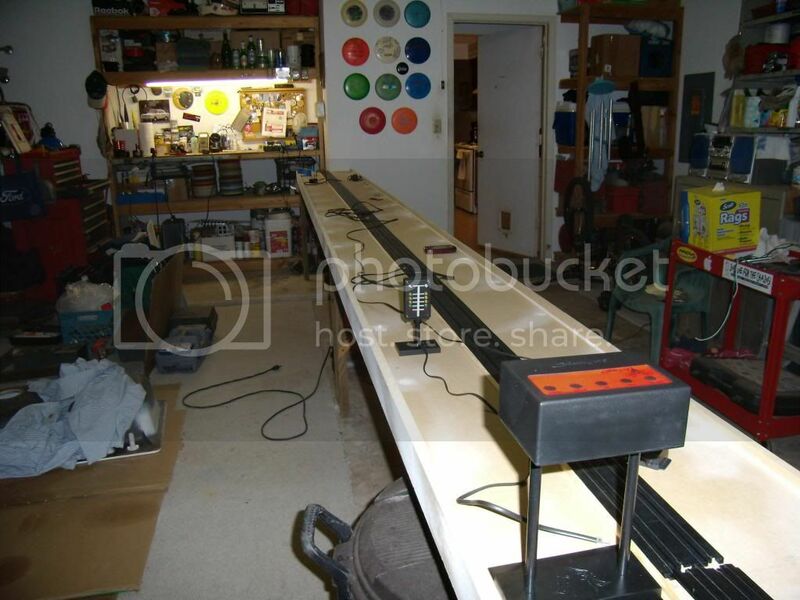 Track is Tomy AFX sectioned, 1\64th scale 1000" (15' 7" timed), Mastech 0-30vdc 0-10 amp power supply, Slot Dragon timing system. 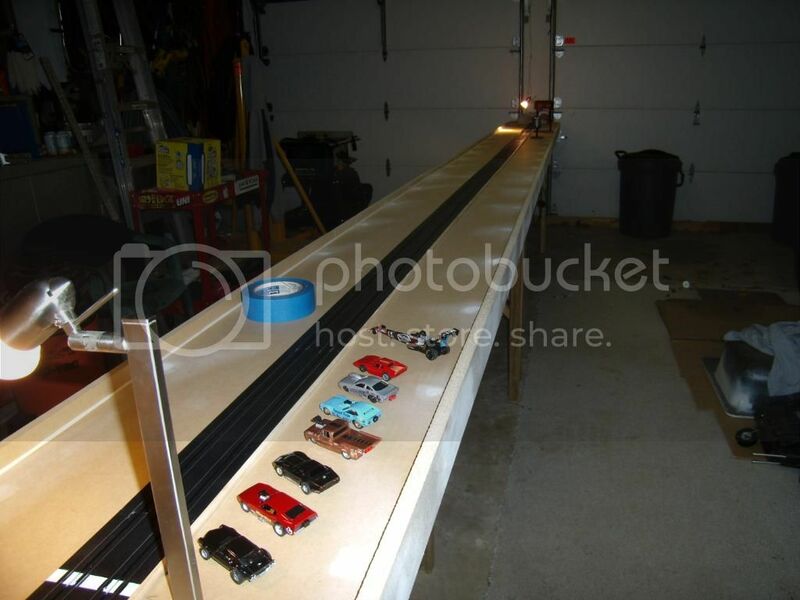 Going to be testing track and new builds for upcoming race thru Dec., then break down to complete the detailing. I will be hosting an event for the 2013 season. No room inside the house for a track. The only available real estate was right down the middle of the garage. That's my long term project on the right. This gave me an excuse to push it out and clean it up a bit. 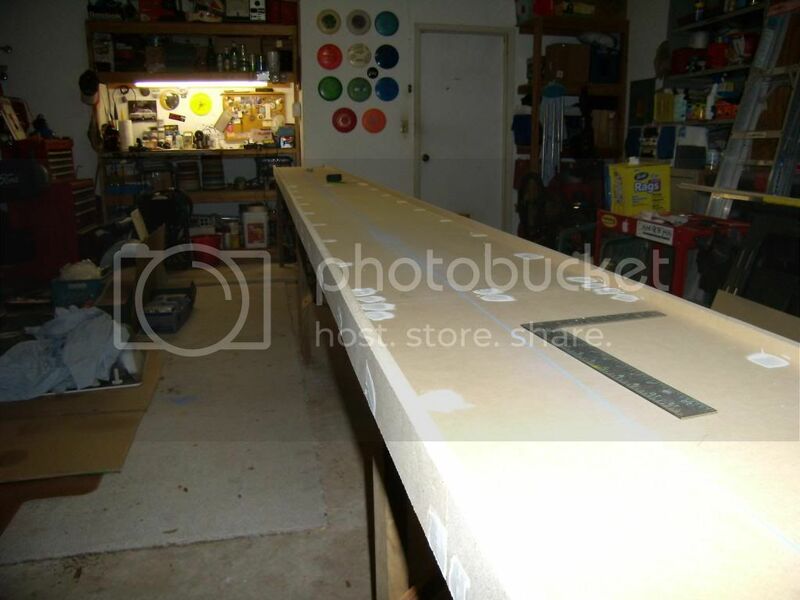 Main table is 1/2" mdf framed 16" wide x 20' long. Nevermind the dirty garage...that's part of this project too. Next phase. Preliminary layout.....checking wire routing, etc. 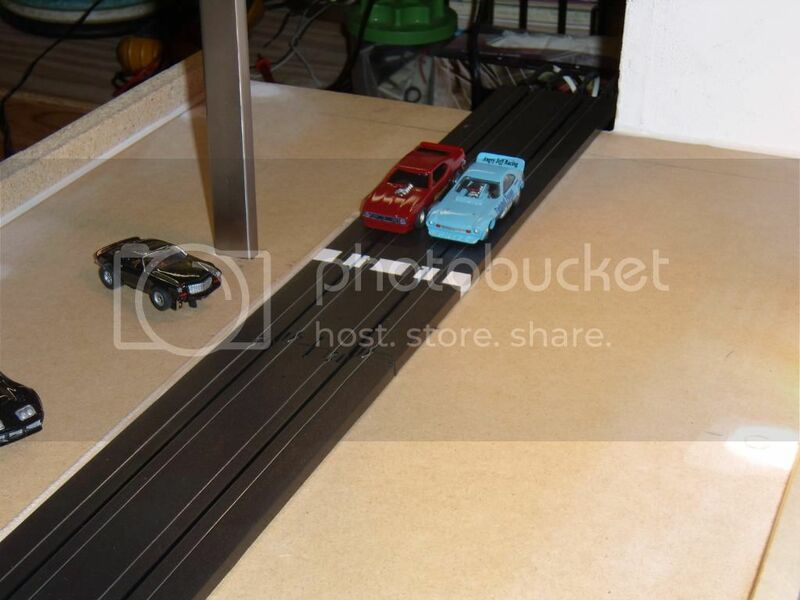 Decided to put the display at the finish more like a real track. Display is large and very visible. Tree had to be located further down the track than I wanted because of cabling, but it is also very visible and turned out to be pretty good. After holes were drilled, optical sensors mounted, and wires hidden. Still need light sources and track wiring. 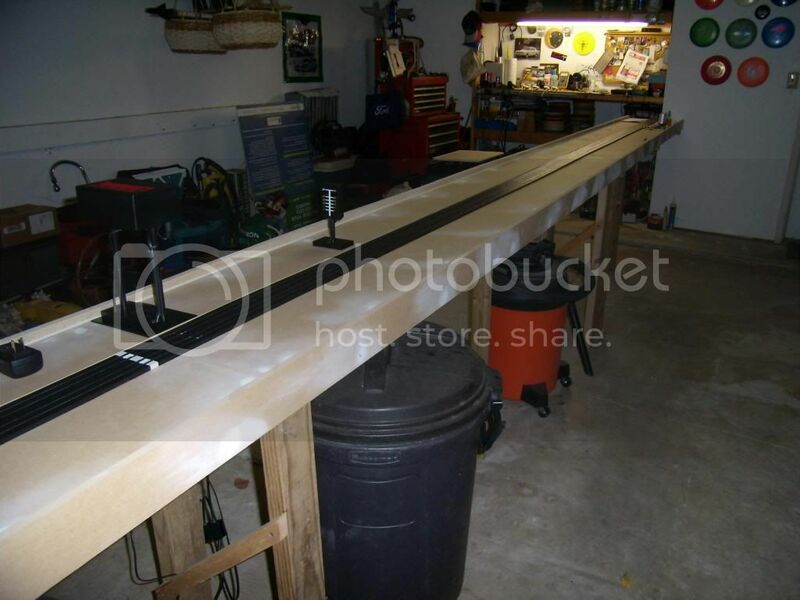 I elected not to use a terminal track and modified a piece of track so I could solder wire directly to track rails and insulate with shrink wrap. 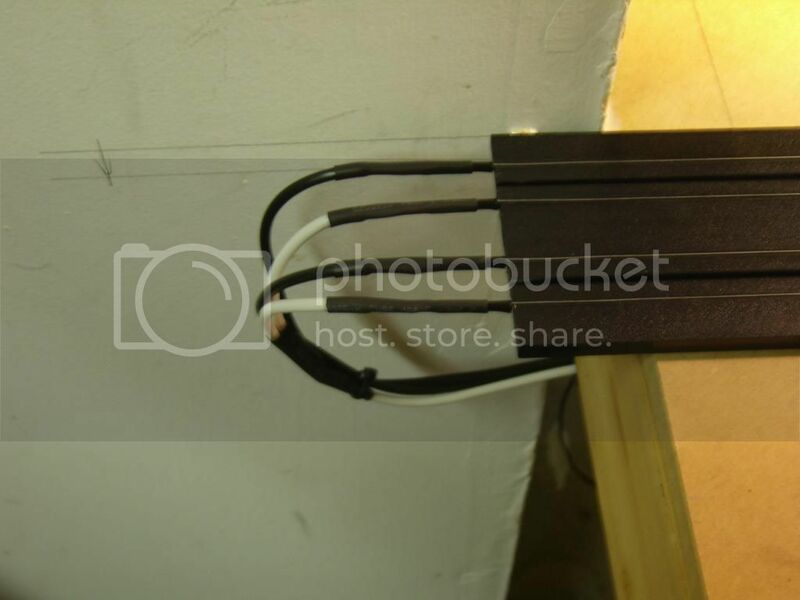 Wiring is run to a terminal board and power supply. Controls are wired or clipped in. Started getting all the pieces to the puzzle in August. Sold some stuff from one hobby to pay for another. It worked out pretty well. The actual building began Nov. 1, so it's progressed to this point pretty quickly. I've been wanting a good track for awhile now. Today was the first time to run any cars or do any testing. These were the first 2 cars to run. Had to do some sensor and lighting dialing in. It turns out that my lights were too bright and I had to misdirect them a little. Sensors are very sensitive and accurate. Was a close race. I ran each lane separately and both lanes, pretty much all the cars I had.....some fast...some slow and had no problems with the Slot Dragon system. I am very pleased with it. I only had 1 issue that I think can be corrected with better sensor placement in the track. I did not think about this when I installed mine. I was able to get around this though. New home track in North Texas under construction. . . , then break down to complete the detailing. I will be hosting an event for the 2013 season. Nice setup. Look forward to seeing after the detailing is applied. in the 2013 race season. With top fuel the front wing will make the sensor and stage the car, then opens once it clears then, makes again on the back part of the car. I found a solution for me so I don't have to relocate my sensors. I manually stage the car past the front wing and pull in to stage car from there. Some of the cars that showed up for testing. Anywhere from unlimited 4 gear to stock AFX. No problems at all. Slot Dragon performed flawlessly. Got to start planning the details now. Thank you Ninja and Eagle. You have to work with what ya got. I am pleased with how the build has gone. It's good to finally have a track. Once again......got to thank all the members that put the information on the forum. Looks great! Can't wait to see a race on it! you say "North Texas"...you near Eagle Jeff? I know you race together at Eagle's track but I'm just wondering if this one is within driving distance from me. 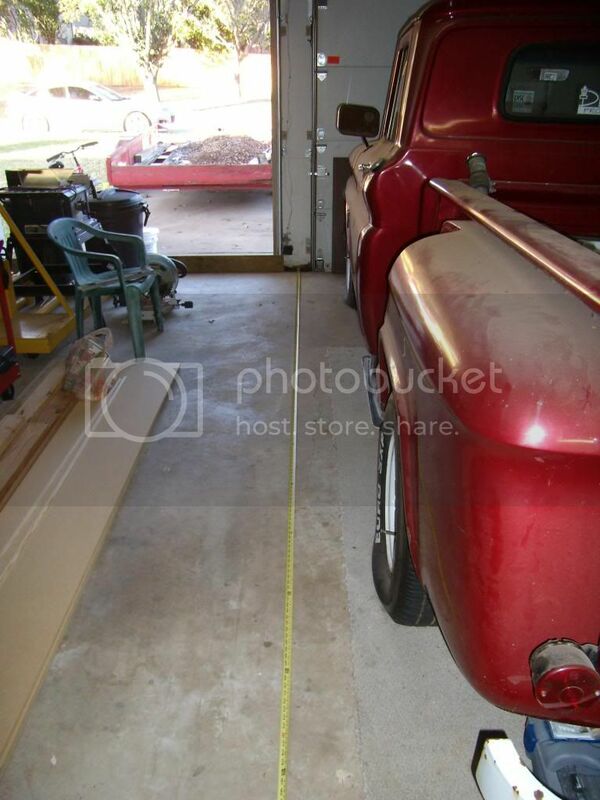 This post and pics brings up a possible prob with my NTF car. 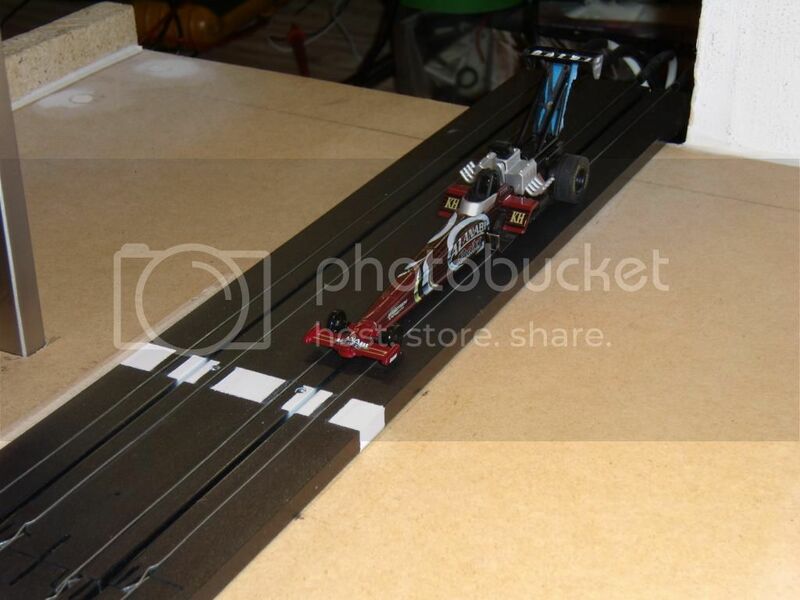 Looking at where the sensors on the track are placed (which is where I'll probly put mine too once I get going on my track) it appears that my dragster won't trip the lights til it gets way behind the front wheels! Or if it does, it might trip twice too when the front axle hits, then it hits again behind the wheels. Wonder if I need to 'revise' my casting and add in some more plastic at the bottom so it's wider. Guess I'll need to see how it works before I go all 'crazy', since I don't have a testing track to find out. Thanks Bondo for the good word. I know there were a few people inquiring about the Slot Dragon system and how it works. Thought I would provide a little insight while doing my testing. That is the only issue I have had, but like I said, I think if the sensor was placed a little closer to the slot, it would eliminate this as an issue. 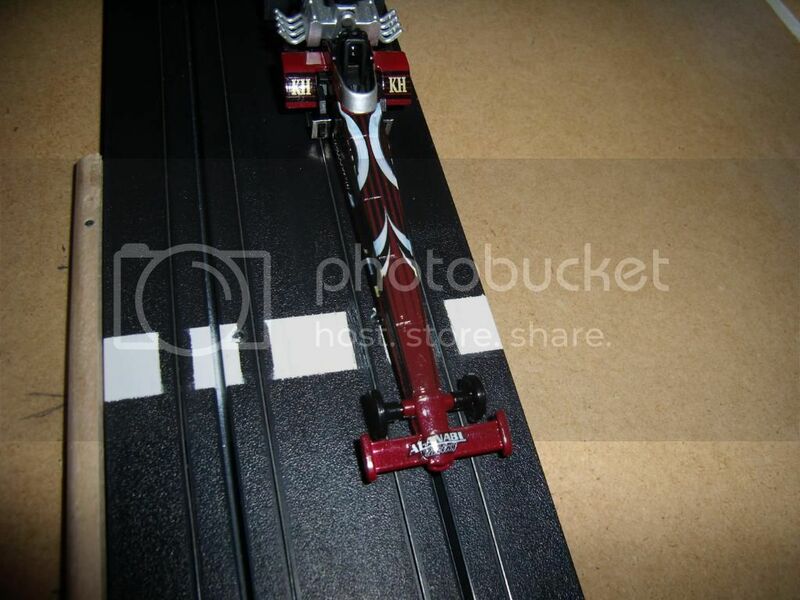 I just didn't think about the dragsters when I installed mine in the track. 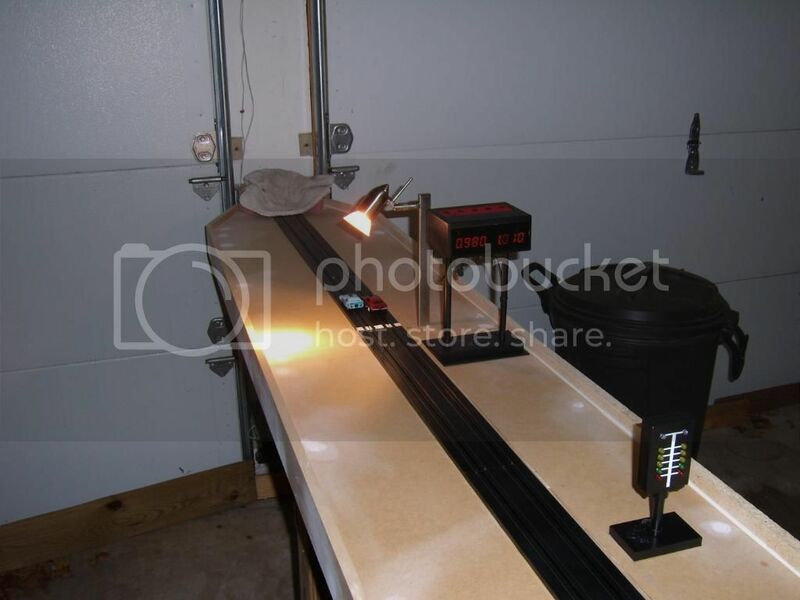 But by placing the car on the track with the front wheels in front of the sensor and then staging the car normally, I was able to resolve the problem. I ran probable 20 runs like that with no problems at all. OH........DUH.......I should have mentioned.....seemed to happen more in the left lane. Could be as simple as lighting angle too. More testing to come. I'm in Euless about 40 minutes from Eagle.